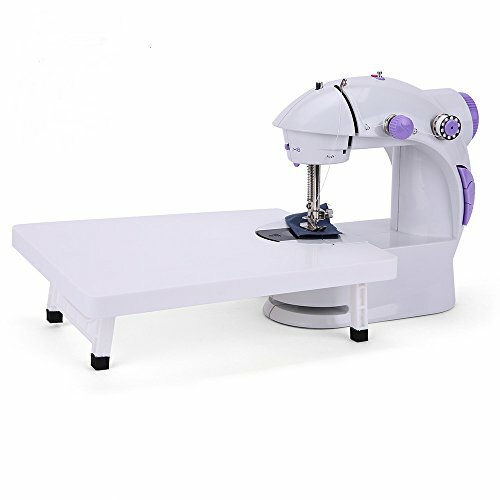 This sewing machine with extension table for your convenience. Light weight, versatile, and practical has 2 speeds settings, tension adjuster, and automatic bobbin winder, save time and money making perfect repairs and adjustments to your crafting pieces. Good for beginners and everyday sewing projects. Design the pattern whatever you want to sewing in textile like clothes, pillow cover and bed sheet etc. Good for beginners and everyday sewing projects. Double thread, double speed (Low / High) control with foot control pedal for easy sewing control and handling. The sewing light lets you see all the minor details in your work. Thread Cutter: no scissors needed, saving your time, while the thread cutter saves you messing around with scissors - a handy feature when taking to a sewing class. Mini size, portable and save space for you. Easy to use. lightweight could be taken to everywhere. AC/DC operation: Requires AC/DC adapter or 4"AA"batteries(not included). ★ Double thread, double speed (High and low speed switch, sew at your own speed). ★ Automatic thread rewind (Bobbin winding). ★ Built-in sewing light(improving visibility), and built-in thread cutter (no need for scissors). ★ With CE, FCC certificate and so on. Use 1000mAh strong power supplier or 4"AA" batteries (not included), and use hand switch or foot pedal to start (For easy use when sewing ). View More In Industrial Machines. If you have any questions about this product by BAITENG, contact us by completing and submitting the form below. If you are looking for a specif part number, please include it with your message.